You've probably heard somewhere along the line that soda — even the diet variety — is bad for your teeth; it's a highly acidic beverage that can actually erode dental enamel, leaving teeth vulnerable to decay. Yet if soda is your drink of choice, you may have put that information right out of your mind. 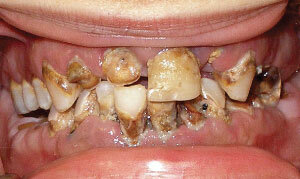 If so, a new study by the Academy of General Dentistry (AGD) is going to make it harder to do that. 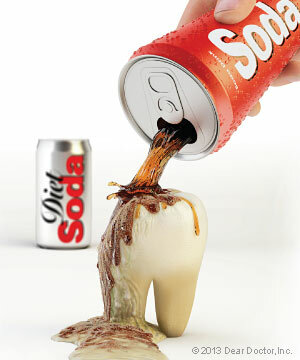 In a recent issue of General Dentistry, the AGD's peer-reviewed clinical journal, researchers made a shocking discovery: drinking large quantities of soda can be as damaging to teeth as using illegal drugs. If this sounds hard to believe, have a look at these pictures. The study's lead author, Dr. Mohamed A. Bassiouny, examined patients at dental clinics in Philadelphia and Appalachia over the course of two decades. He found a striking similarity between the teeth of patients who consumed large quantities of soda and those who used methamphetamines or crack cocaine. In his article, Dr. Bassiouny, a professor of dentistry at Temple University, compared the damage in three individuals' mouths: an admitted user of methamphetamine, a previous longtime user of cocaine, and a woman who drank two liters of diet soda per day. Dr. Bassiouny noted that you don't even need to consume as much as two liters of soda per day to damage your teeth, as the effect of soda-drinking is cumulative. 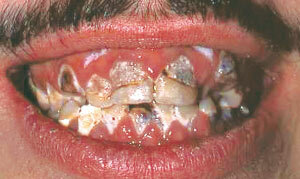 Even those who drink more than one regular-sized 12-ounce soda per day are at risk of dental erosion, he said. “The striking similarities found in this study should be a wake-up call to consumers who think that soda — even diet soda — is not harmful to their oral health,” Dr. Bassiouny said.